Here is a message from NSO about their Magic: The Gathering Draft Tournament on Sunday. Dark clouds settle over the glistening realm of Mirrodin. The forces of Phyrexia, which have germinated in secret in the core of the plane since the planeswalker Karn first forged it from the void, have begun their invasion of the surface in earnest, and they are winning. There can be no neutrality in this war - the beleaguered inhabitants of Mirriodin must either submit to the flayed emissaries of the Great Work or arm themselves against the ever-growing tide of corruption. Now, you must choose your side. 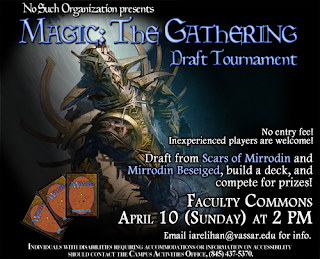 Join the NSO for the spring semester Magic: The Gathering draft tournament! All participants will receive 2 packs of Scars of Mirrodin and 1 pack of Mirrodin Besieged free of charge, with which they can compete for the top spot - additional prizes await the victors! Don't know how to play, or don't know how to draft? No problem! Just come a little bit early, and experienced players will be happy to fill you in on the basics of this exciting and engaging game. If you have any questions, please contact Ian Relihan at iarelihan[at]vassar.edu.